Temple University Beasley School of Law, L.L.M. DEJON C. DELPINO joined MDAF as an associate in 2019. Prior to joining the firm, Ms. Delpino focused her practice on defending claims involving motor vehicle accidents. Ms. Delpino currently focuses her practice on defending claims involving motor vehicle accidents and premises liability. 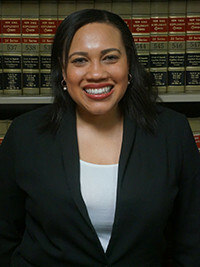 Ms. Delpino formerly taught Legal Research and Writing as an adjunct professor at Temple University Beasley School of Law.